You can add a discussion forum gadget to a page on your Wild Apricot site so that members can post messages and reply to other messages. Adding a forum page provides your members a place to congregate, collaborate, and discuss ideas. You can create as many discussion forums as you wish, each on its own page. You can limit access to a forum by placing it on a page with restricted access. Even if you place the forum on a public page, you can still use the discussion forum gadget's settings to control functionality for public visitors and members. You cannot add a discussion forum gadget – or any other singular gadget – to a page template or system page, or to a page containing another singular gadget. You can add a forum summary gadget to a page to display a summary of the activity in multiple discussion forums. Using the forum updates gadget, you can display a list of the most recent forum updates. You can embed a Wild Apricot forum on another website using widgets. Go to Site pages (under the Website menu) and create or begin editing the site page where you want the discussion forum to appear. Drag the discussion forum gadget from the list, and drop it where you want it to appear on the page. You can insert it into a section within a layout, or above or below a layout. From the gadget settings panel on the left, choose the desired settings for your discussion forum. You can choose the forum name, enter a description, pick a category, and decide what kind of visitors can read, respond to, and post forum topics. For more information, see below. Now that you have added a discussion forum gadget to a site page, you can adjust the discussion forum gadget settings to control the appearance of the page and the ability of visitors to read, respond to, and post forum topics. Gadget settings appear in a panel on the left side (which can be hidden to maximize the page design area). To display the settings panel, you position your pointer over the gadget – while editing a site page – then click the gadget's Settings icon. The following discussion forum gadget settings are available. 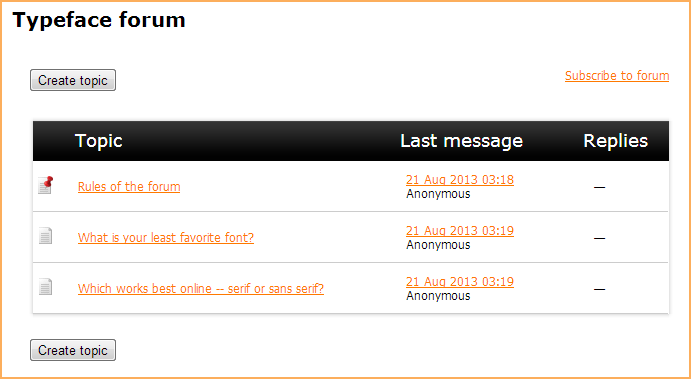 The name used to identify the forum within the settings for the forum updates gadget and forum summary gadget. If you want to display a picture above the member's name in forum messages, you can select a picture field from your contact or membership database. You might, for example, allow members to chose avatars to represent their online identity. If member pictures are enabled, the member's picture will be displayed in their forum posts unless the picture field is restricted under their privacy settings. You can set the default order in which forum replies are listed (newest to oldest or oldest to newest). 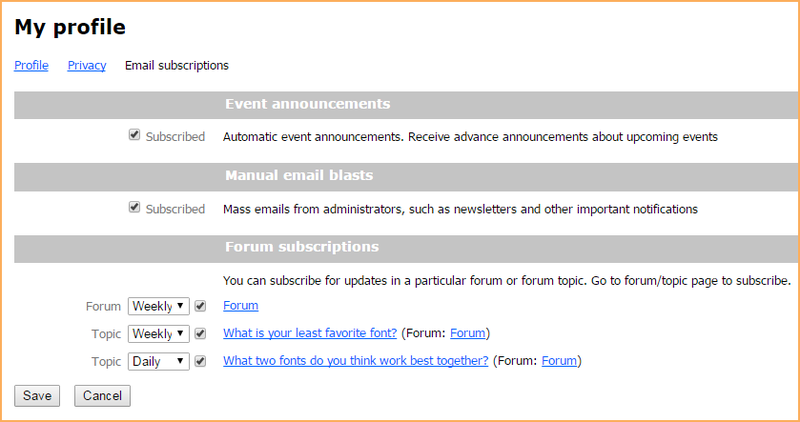 Visitors to your forum will have the option of changing the order for each forum topic. You can provide a brief description that will appear for the forum on the forum summary gadget, and optionally, on this gadget as well. You can control whether the forum description appear on this gadget as well as the forum summary gadget. If you have multiple forum pages, you can assign each one to a category. The categories are used to group forums on a forum summary page. To create a new category, click Add new, then type the category name in the field below. For each type of visitors, you can control whether they can view, comment on, or post forum topics. You can set access permissions separately for public visitors, and for each membership level and member group. If you restrict permissions by both membership levels and member groups, then members will be granted the highest permission assigned to the levels and groups they belong to. For example, if you provide read-only access for Bronze members but full access to members of the Steering Committee member group, then a Bronze member who is also a member of the Steering Committee will be granted full access. No access: Cannot read forum topics. Read: Can read topics, but cannot reply or create new topics. Read, comment: Can read topics and reply to them, but cannot create new topics. Read, comment, create topics: Can read topics, reply to them, and post new topics. Public visitors (non-members) can never create new topics. Administrators in admin view can always view, reply to, create, modify, and delete topics. In public view, administrators are subject to the same restrictions as others at the same membership level. CSS code to control the behavior or appearance of the gadget. For example, you could enter width: 250px; to control the gadget width. To prevent automated software – known as spambots – from bombarding your forum with spam posts, you can enable Wild Apricot's anti-spam Captcha feature. 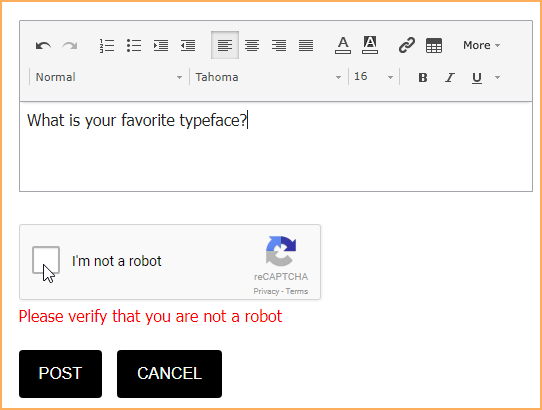 With Captcha enabled, visitors to your forum would have to enter a set of characters – proving them to be a person rather than a program – before being able to submit a forum topic or reply. 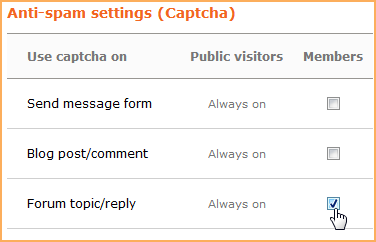 To enable Captcha for forum posts, go to Settings, and click Anti-spam settings (Captcha) under Security. On the screen that appears, click the checkbox beside Forum topic/reply then click Save changes. Some spambots can use OCR technology to bypass Captchas, so you might consider restricting forum replies to logged in members. If you continue to receive a lot of spam, contact us and we'll try to identify and (at least temporarily) block the spammer's IP address. You can add a title and description for a discussion forum by inserting a content gadget ahead of the discussion forum gadget. 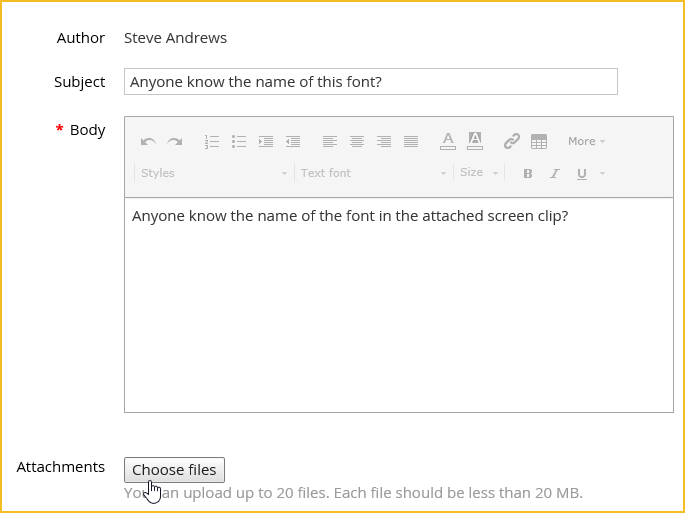 Within the content gadget, you can format the title and description using text styles. For more information on inserting text and using text styles, see Using the content editor. 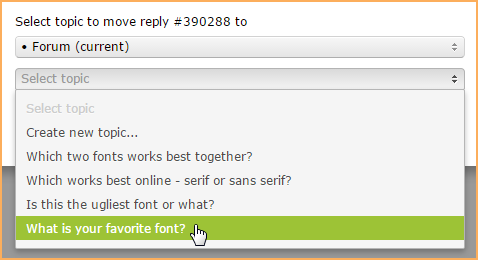 You can change the colors and text styles used on your discussion forum from the Colors and styles screen. You can customize the forum page that appears when visitors create, view, or reply to forum topics by modifying the Forum topic system page. Within the system page list, select Forum topic. When you are finished modifying the forum topic system page, click the Save button. To add CSS customization, hover over the Website menu and select the CSS option. From the screen that appears, enter the appropriate code for your customization, then click Save to preview your customization within the preview area on the right. When you are finished making your changes, click Cancel to close the screen. Using CSS code, you can remove the name of the author of the last update from discussion forums. This customization will also remove the author's name from the recent blog posts gadget. 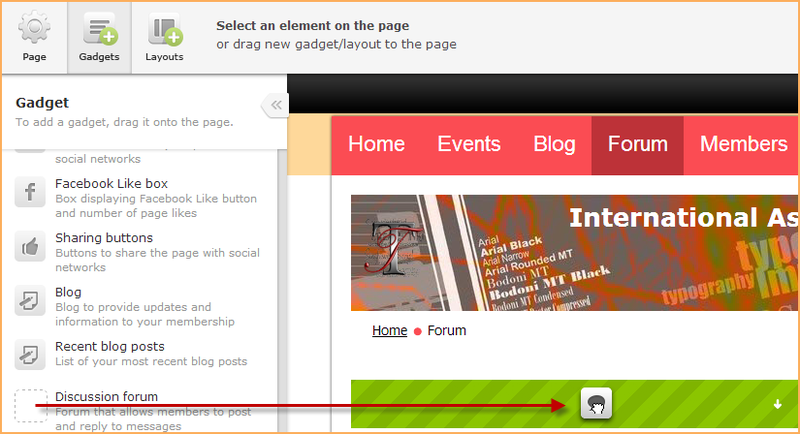 This customization will also remove the author and date from the recent blog posts gadget. When a contact is removed from your contact database, their forum posts will be attributed to Deleted user. where New label is the label you want to appear in place of Deleted user. When you visit a discussion forum page, the options available to you may depend on whether you are a member, and if so, on your membership level. If you are not already logged in, you will be prompted to sign in using your Wild Apricot credentials when you try to add or reply to a forum topic. Who can do what in a forum? Who can do what in a discussion form depends on whether they are an administrator, a member, or a public visitor (i.e. not logged in as a member). The available functionality is summarized in the table below. After clicking this button, you can enter the subject and the body of the new topic. You can use the content editor toolbar to format the body text, and add pictures, documents, links, and tables. Administrators in admin view can also add ArtText or modify the underlying HTML. Once you are done composing the topic, click Create. The topic will now appear on the main forum page. After clicking this button, you can enter the body of your reply. You can use the content editor to format the text and add links. Once you are done composing your reply, click Post. When adding or replying to a forum topic, members can attach documents and images. The supported document types are: TXT, PDF, DOC, DOCX, XLS, XLSX, PTT, PPTX, ZIP, CSV. The supported image types are: JPG, JPEG, GIF, PNG, TIF, TIFF. To attach a file to a forum topic or reply, click the Choose files button beside Attachments. You can attach up to 20 files, with a single file size limit of 20 MB. Once you choose your files and post the topic or reply, they will be displayed at the bottom of the topic or reply. Image files will be displayed as thumbnails, and document files will be displayed using their file names. To remove an attachment – before posting or while editing the topic or reply – click the X beside the file name for documents, or hover over an image and click the X. Members can subscribe to your forum, or to individual topics within the forum, so that they receive email notifications of updates. 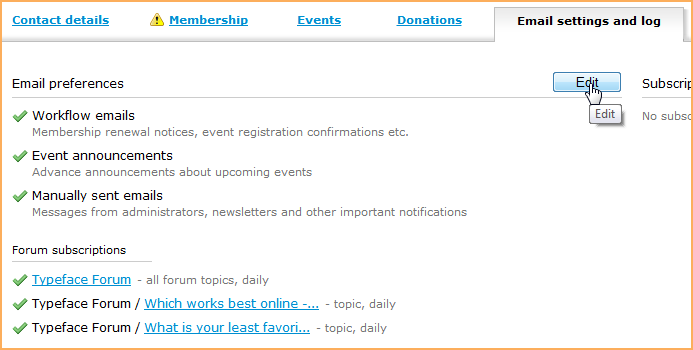 After receiving the notification, a member can visit the forum to view the new topics or replies. Only members can subscribe themselves to a forum or forum topic – the subscription cannot be set up by an administrator. However, once the member has subscribed, either the member or an administrator can set the frequency of the email notifications. Members are not subscribed by default to any forums. Administrators cannot customize the forum notification email. The forum date, time, and format shown to the public is also based on your organization's timezone and date/time format. Finds the member in the contact database and displays the member's details. Clicks the Email settings and log link. Clicks the Edit button beside Email preferences. The administrator can now unsubscribe the member's existing subscription and change the frequency of the forum update notifications. An administrator cannot subscribe a member to a forum. Once finished making changes, the administrator clicks Save. In public view, you can only modify or delete the topics or replies that you have posted. In admin view, an administrator can modify or delete any topics or replies. Administrators can also move and merge forum topics, move forum replies, and create a new topic from a reply – all from admin view. To view the forum in admin view, go to Site pages (under the Website menu) and display the page where the discussion forum gadget appears. To modify a topic you have posted, display it then click the Edit link above the first message in the topic thread. To modify a topic in admin view, display it then click the Select action drop down and choose the Edit option. To delete a topic you have posted – including all comments and replies – display it then click the Delete link above the first message in the topic thread. To delete a topic in admin view, display it then click the Select action drop down and choose the Delete option. Once deleted, a forum topic cannot be restored. To move a forum topic (and its replies and comments) from one forum to another, display the topic then click the Select action drop down and choose the Move option. From the dialog that appears, choose the forum you want to move the topic to. Subscribers to the original topic will continue to be subscribed to the topic in its new location. The URL of the original topic will be redirected to the new location. Subscribers to the destination forum will receive an email notifying them of the new topic. You can merge two forum topics within the same forum or between forums. To merge topics, display the topic you want to append to another topic, then click the Select action drop down and choose the Merge option. From the dialog that appears, choose the target topic with which the original topic will be merged (and the forum name, if the target topic resides in a different forum). The original topic (along with its replies and comments) will added to the end of the target topic. Subscribers to the original topic will automatically become subscribed to the target topic, and subscribers to the target topic will receive an email notification of updates to the topic. In public view, you can only modify the replies that you have posted. In admin view, an administrator can modify or delete any replies. To modify a forum reply – either in admin view or public view – display it then click the Edit link above the reply. In public view, you can only delete the replies that you have posted. In admin view, an administrator can delete any replies. To delete a forum reply – either in admin view or public view – display it then click the Delete link above the reply. To move a reply to another forum topic, display the topic in admin view then click the Move option above the reply. From the dialog that appears, choose the forum topic you want to move the reply to (and the forum name, if the topic resides in a different forum). Subscribers to the selected topic will receive an email notification of a new reply. 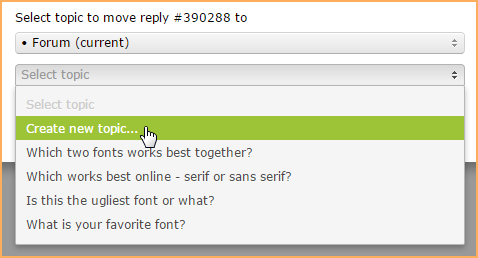 To create a new forum topic from a reply, display the topic in admin view then click the Move option above the reply. From the dialog that appears, choose Create new topic. In the field that appears, enter the name of the new topic then click the Create topic button. Subscribers to the forum will receive an email notification of a new topic.